If you are going to the snow you might want to grab this deal. Especially with the new snow today. 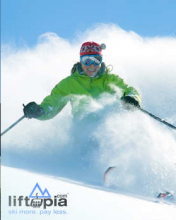 Living Social is offering $25 to spend on ski lift tickets for only $12! This is on on-line deal so anyone can use it! Almost all Tahoe resorts are included in this deal! If you sign up through Frugal Day you’ll get $5 off on the next deal you take advantage of too. Click “Buy Now” to get this offer. Daily deals Feb 15, 2011 in entertainment, LivingSocial, outdoor · Expired! Get a free Urban Bird Kit from Cornell Lab of Ornithology. Included in the kit are free downloads, a Celebrate Urban Birds poster, a Silhouette Poster to help identify birds, a “Zero Means A Lot” sticker, and a packet of seeds. Click here to get your FREE kit. I’m really glad to see this mail in rebate! We just ran out of propane on our grill. Right now you can get a $5 rebate from AmeriGas when you purchase AmeriGas blue propane. Click here to download the form. Did you get a new grill? There is also a great coupon for first time buyers. Use this $2 printable for the purchase.